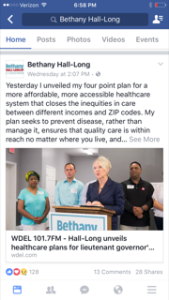 So, I hadn’t really been thinking that much about Bethany Hall-Long, or her campaign for Lt. Governor, since she is about as exciting as paint drying. That is, if you ignore the antics of her husband.Typical democrat, votes for all the right, or should I say, all the left issues to keep her Democrat credentials. So imagine my surprise to discover, either she, or one of her campaign people, are cowards. You see I happened across a Facebook link to her page concerning her announcement of a four point healthcare plan. 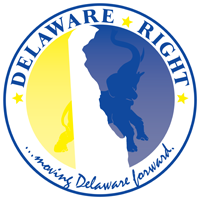 A quote from the post, “Creating a stronger, healthier Delaware has been my life’s work”. Seems she has some background in the healthcare field, and she has decided to make healthcare the center plank of her campaign. Okay, all well and good, go with your strength, if you have one. Here is a screen shot of the post. The problem is, I asked a question in the comments, it went something like this. Well I would, only one problem, my comment has been taken down, and my ability to comment has been blocked. I promise, the above question is very close to the actual question, I asked with respect, and truly wanted the good senator to simply expand on why her plan was needed. Instead of taking the opportunity, she or one of her lackeys, chose to run and hide. It amazes me when politicians allow themselves to be defined by such stupid mistakes. Now instead of being the candidate for healthcare, she is just another politician too intellectually weak to defend her position. This speaks to character if you ask me. I have seen both sides of this type of situation. I have seen many politicians who can’t get beyond empty rhetoric on any topic, even topics they claim to be expert in. So when asked real questions they deflect, and in this case they edit and pretend the question was never asked. I think Bethany Hall-Long just became the Lacey Lafferty of the Democrat Party. And while I am on the topic of character, let me also now relate an incident I witnessed first-hand involving Senator Hall-Long. Recently my wife’s grandfather passed away, he was a well-respected member of the Volunteer Fire Fighter’s brotherhood, with eighty some years of service, who had been through all the chairs a fire-fighter can hold in the state and Delmarva associations. It was a rather large service held at the Townsend Fire House. The service involved several hours of visitation time prior to the service, which included much ceremony. This was followed by a large caravan to the cemetery, where more formal ceremony was held. Following this the people were invited back to the fire-house for fellowship. As we pulled into the parking lot I spotted someone I recognized, Senator Hall-Long. I recognized her for one thing, she was wearing the bright royal blue dress she is so fond of. I guess a more appropriate black dress was in the cleaner’s. Since I had to explain who she was to the entire family, it was clear she was not a close acquaintance. As we exited the vehicle she began circling the crowd. I heard her several time using her name as if it meant something, “high, Bethany Hall-Long”, “High, Bethany Hall-Long”. We entered the hall, and I witnessed her “working the room”. Again introducing herself as “Bethany Hall-Long”. I will say I never heard her use her title, nor talk about her campaign. She did mention she couldn’t make the earlier portions of the services due to an event she had to attend. One funny thing though, when my mother in-law asked her about helping with an issue concerning settling an issue with the estate, Sen. Hall-Long gave a card, her campaign card, she apologized that she didn’t have her senatorial card with her. I did not publicize this when it happened, but I now believe it speaks to a larger character flaw of the Senator. Let us not forget this is the same woman who didn’t know where her husband was in the middle of the night when he was out pulling up her opponents signs along the roadside. She also had no idea about the allegations that her husband had used his position in the housing administration to influence people in subsidized housing to vote for his wife. And now her campaign can’t answer a simple question about an issue she claims to be expert on, and they edit the question and block the questioner from asking more questions. 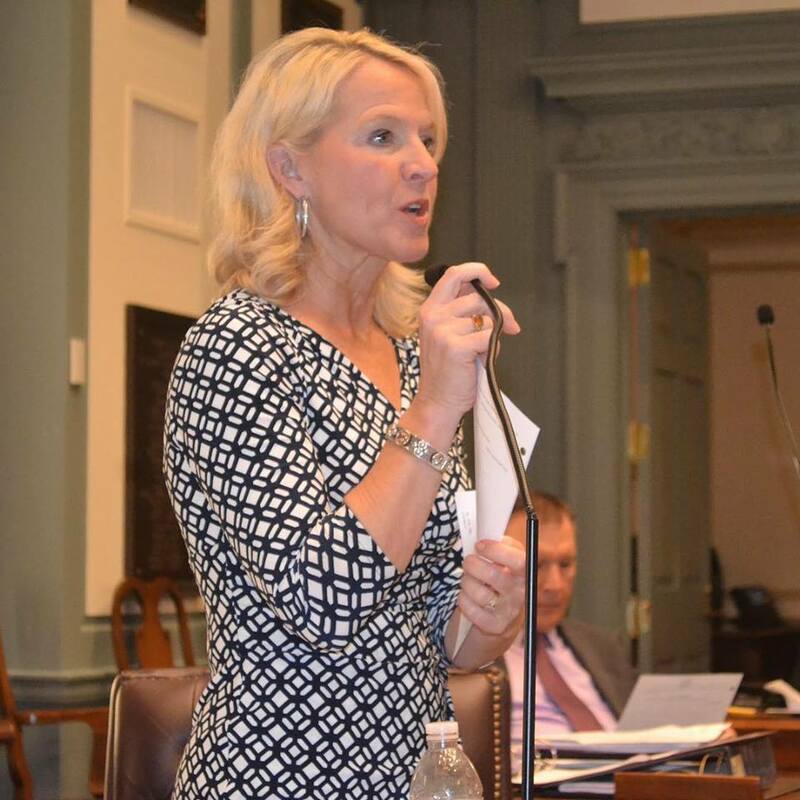 Is this the style of leadership Delawareans could expect from her as Lt. Governor, which we all know is seen as a step closer to the governor’s seat? 18 Comments on "I Really Didn’t Care, But Now I Do"
Which R can beat her? Who is even running for Governor or Lt. Gov on the Republican side? 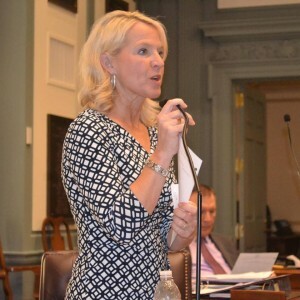 La Mar Gunn of Dover is the Republican candidate for Lt. Governor. He has no primary opponent, so he will be on the ticket in November. All you offer is name calling. Either join the conversation with some real input, or leave, or we can show you the door. She’s just another Socialist know-it-all, with a conniving slob husband. I notice that Aetna Insurance is abandoning Obamacare. Of course, this was the Socialist-Democrats’ plan all along; force the insurance companies to make a choice between sticking with Obamacare and facing bankruptcy, or abandon the program. Eventually, the Socialist-Democrats will initiate pure government “insurance,” because most private carriers will have left government subsidized insurance. Then, we will follow the European model so adored by Socialist-Democrats; long waits for appointments and surgeries, third-world doctors and an endless money pit (after all, the Socialist-Democrats will make sure the government get their piece of the action). Thanks to the Socialist left, in just a couple of decades we will have gone for the best healthcare system in the world to sheer mediocrity. That’s what Socialism is- enshrined mediocrity at a premium price. And you “know” European health care is terrible because you’ve lived in Europe or because you listen to so much right-wing radio. Don’t mess with Bethany. She will eat you alive. Mitch, where are you? OUT TO LUNCH? This is a job for John Daniello. …but you didn’t notice that their threat to do so was a bargaining tactic in pressuring the DoJ to approve their acquisition of Humana. The plan is and always was government run healthcare. And it will be run the same way as perennial losers AMTRAK and the USPS. The only thing our government runs well is deficits- now at $19 trillion. Give it up, rick. That’s been debunked by even the WSJ. “…public programs control per capita spending somewhat more effectively than private coverage does. “ – The Wall Street Journal, Apr 16, 2015. Bethany or her staff member did the right thing. Avoid you at all costs. You are like the plague. What you touch turns to shi_. AMTRAK and the USPS lose billion$ every year. So you want the same idiots running the healthcare system? Typical Socialist-Democrat. Wear your nose ring proudly- just like a cow. Monopolies like Planned Paranthood? The teacher’s unions? Planned Parenthood has murdered more blacks than the Grand Wizard of the KKK could ever dream of, and the teacher’s unions have orchestrated the implementation of a social-engineering curriculum that has moved our student’s proficiency from the top of the world to the middle-of-the-pack status in international tests. Abortions and unions have been legal for years. Get over it. I realize that Planned Parenthood has been doing the KKK’s work for years. PP’s founder, Margaret Sanger, wanted to rid society of “undesirables.” So it’s good, right. And I know that our teacher’s unions have enshrined academic mediocrity for years- and the tests prove it. So that’s good, right? aetna insurance has been on the downslide for years. you can’t find specialists that will take it. they lose money with every transaction.